Although this was also a personal occasion (Faust said she was “a little stunned to see almost every person in the world that I am related to sitting here in the first few rows”), she focused on the most institutional of purposes. In the presence of nine of her former teachers, from elementary through graduate school, and more than 200 representatives of higher education from around the world, she defined the essence of the university as being “uniquely accountable to the past and to the future—not simply, or even primarily, to the present. A university is not about results in the next quarter; it is not even about who a student has become by graduation.” Rather, she said, “A university looks both backwards and forwards in ways that must—and even ought to—conflict with a public’s immediate concerns and demands.” As “stewards of living tradition,” she said, universities “make commitments to the timeless,” endeavors pursued “because they define what has, over centuries, made us human, not because they can enhance our global competitiveness.” As agents of uncomfortable change, accountable to the future, “universities nurture a culture of restlessness and even unruliness.…transforming individuals as they learn, transforming the world as our inquiries alter our understanding of it, transforming societies as we see our knowledge translated into policies” and new therapies. And she arranged three times—in her own address (see “Knitt Together...As One”), and twice in readings by relatives—to invoke the most deeply rooted American beliefs in community and in progress, to enlist engaged, energetic, and accountable membership in the Harvard community. The twenty-eighth president—deemed a “rebellious daughter of the South” and "Harvard’s president of reinvention” by Amy Gutmann—receives applause from (left to right) University Treasurer James F. Rothenberg; Frances D. Fergusson, President of the Board of Overseers; James R. Houghton, Senior Fellow of the Harvard Corporation; and Marc Goodheart, Secretary of the University. For the most part, it was others who pointed out how extraordinary the installation of the University’s twenty-eighth president was. Amy Gutmann ’71, Ph.D. ’76, now president of the University of Pennsylvania, extended greetings from academia to Faust, who earned her master’s and doctoral degrees from Penn. “For the first time in 371 years, Harvard has chosen as its president…a Southerner,” she said, with perfect timing, to laughter and cheers, “and a woman”—a development in which “Cotton Mather, Harvard class of 1678, would surely see Satan’s hand.” Faust subsequently acknowledged the obvious (“My presence here today—and indeed that of many others on this platform—would have been unimaginable even a few short years ago”), but promptly used her individual status to punctuate her point about the institution (“Those who charge that universities are unable to change should take note of this transformation, of how different we are from universities even of the mid twentieth century”). Although Faust chose to focus on academia generally, Gutmann limned Harvard’s distinctive role and alluded to Al Gore Jr. ’69, LL.D. ’94, who hours earlier had been named co-recipient of the Nobel Peace Prize. Like any ritual, of course, an inauguration is not all spinach. Alongside the rhetoric there is rigmarole. Substance is addressed head on, but also symbolized. Further tweaking the pomp in these circumstances, Karen MacDonald, lecturer on dramatic arts, of the American Repertory Theatre, burst into the Sanders proceedings in the role of Gertrude, an implacable Cambridge meter maid outraged by an illegally parked car. Informed that it was the president’s, she loudly queried about the missing “1636” license plate (recently reassigned to a Harvard van; the black presidential Lincoln is no longer seen) and expressed astonishment that the incumbent was now a woman—before wading into the audience to honor Faust with her first parking ticket in her august new office. As for symbols, Faust made a major statement about the University by inviting each of her living predecessors—Derek Bok (1971-1991, 2006-2007), Neil L. Ruden-stine (1991-2001), and Summers (2001-2006)—to be seated at center stage, and set a precedent by having them confer some of the symbols of office. In a “We Three Kings” moment, Bok handed forth two silver keys, Rudenstine the earliest College record book, Summers the Harvard seals. Then Frances D. Fergusson, president of the Board of Overseers, and Senior Fellow of the Harvard Corporation James R. Houghton formally invested her in the office, Houghton presenting the final symbol, a replica of the Charter of 1650. The Overseers and Corporation members, minus Robert E. Rubin, looked on from the stage. And at the end of the day’s work, a color guard of Harvard ROTC cadets led the recessional. But unmistakably the farthest-reaching symbolism sprang from Faust’s own experience growing up in the segregated South, as a participant in the civil-rights movement, and as a scholar of the disfiguring wounds of racial division in America. Beyond Toni Morrison’s reading—about a slave girl enmeshed in the mounting witch terrors of 1690—and Kara Walker’s unsettling prints, the Sanders Theatre concert began with the rousing Kuumba Singers and ended with saxophonist Joshua Redman ’91 (and three Harvard sidemen) filling the hall with jazz of sonic-boom intensity. Carla Ann Harris ’84, M.B.A. ’87, of Morgan Stanley and Harlem’s St. Charles Gospelites choir, sang “Precious Lord, Take My Hand” in Memorial Church Friday morning. For the afternoon exercises, the exuberant Harvard College Pan-African Dance and Music Ensemble escorted Faust and her presidential party into Tercentenary Theatre. The penultimate song, before the throng gave voice to “Fair Harvard,” was a rendition of “Amazing Grace” by Simon Estes. “Often inaugural addresses contain lists—of a new president’s specific goals or programs,” Faust observed, but on October 12, she found such lists “too constraining.” Nonetheless, in the events surrounding the installation exercises, and by her actions since assuming office on July 1, she has in fact given many signs of her substantive agenda. In five faculty symposia on Friday morning, Harvard scholars wrestled with issues of intellectual moment and of focused interest to the president and the wider institution. At “The Arts of Interpretation: Whose Meaning Is It Anyway?” Homi K. Bhabha, Rothenberg professor of the humanities, moderated a discussion on the ways we extract meaning from texts, maps, music, and art works—and the ambiguities that doing so entails. Using ob- jects ranging from a 1540s Mexican codex to a contemporary photograph, the panelists explored the problems of teasing apart myth and history in an old painting, works’ political subtexts, and the varied ways in which a perceiver “completes” an art work. In “Decisions, Decisions: Health, Wealth, Happiness, and Neurobiology,” scholars in business, economics, medicine, psychology, and public health examined rationality, emotion, and the cognitive components of making complex decisions—and the implications for training doctors, investing for retirement, or waging war. “Innovation and Impact: Science and Engineering Today and Tomorrow” brought together experts in life sciences, physics, and infectious diseases. Among their common concerns, articulated by Cabot professor of the natural sciences Douglas Melton, was the need for Harvard to become as good in teaching science to undergraduates as it is in conducting scientific research. During the discussion on “Inequality and Justice in the Twenty-First Century,” led by Gottlieb professor of law Elizabeth Warren, associate professor of education and economics Bridget Terry Long said universities, as society’s gatekeepers, have to “acknowledge our own role in creating inequality.” Prescriptions ranged from fostering direct service, such as in healthcare, to crafting policies through which society “can have less [inequality] than there is now,” according to Christopher Jencks, Wiener professor of social policy. Such urgent and interdis-ciplinary conversations are the very stuff of the freewheel-ing, creative work that has come to characterize the Radcliffe Institute for Advanced Study, of which Faust was founding dean prior to being chosen as president. In a letter sent to the University community at the beginning of the academic year, she wrote of “opportunities not just to advance our efforts in discrete fields, but to work to become a university known more for bridges and less for walls,” and described her decanal appointees as “all shar[ing] a commitment…not only to the success of their own faculties and schools, but to the future of Harvard as a whole.” John Winthrop would approve. On September 20, at the launch of the School of Engineering and Applied Sciences, Faust spoke of engineers as builders of bridges; she envisioned bridges between basic and applied science, among technology and ethics and public policy, and among Harvard’s schools and industry and the larger world. In his remarks welcoming Faust to her presidency, Massachusetts governor Deval L. Patrick ’78, J.D. 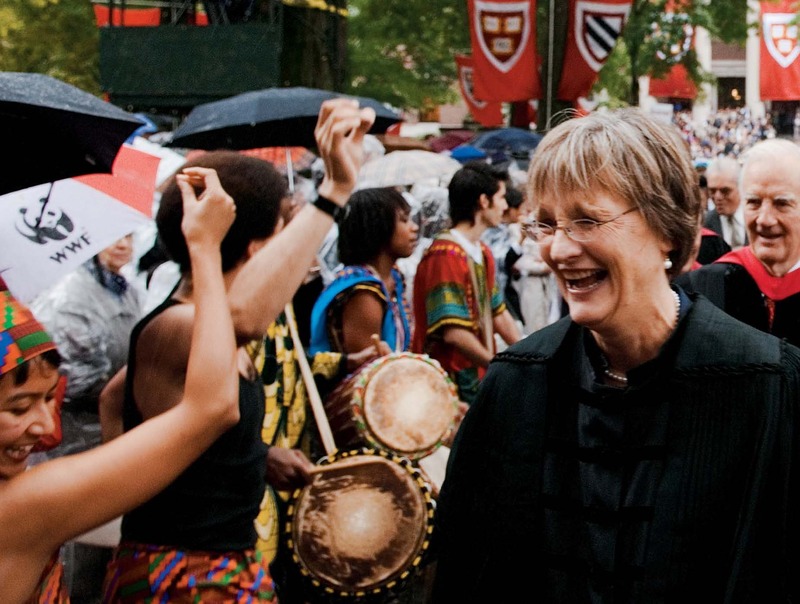 ’82, urged her to “lean forward.” That she will certainly do, soon, enlisting faculty members and others in efforts to think broadly about Harvard’s opportunities in the arts and performance; to build connections among social scientists, much like the new Harvard University Science and Engineering Committee; and to establish the University’s relationships with its local communities on a new footing. Those initiatives must meld with academic planning, Allston physical and construction planning, visions for use of the University’s financial resources, and ambitions that require future fundraising. How all those ventures unfold depends, in part, on the Harvard community’s determination to “knitt together” with each other and with the new president. In an unexpected ending to her installation address, Faust reached into history a final time, to suggest the way to the academic future.